The Metropolitan Manila Development Authority (MMDA), in cooperation with the Autism Society Philippines and the Department of Social Welfare and Development with the support of other disability advocates, conducted simultaneous lectures on Assisting Pedestrians with Disabilities in Makati and Marikina last 24 January 2013. 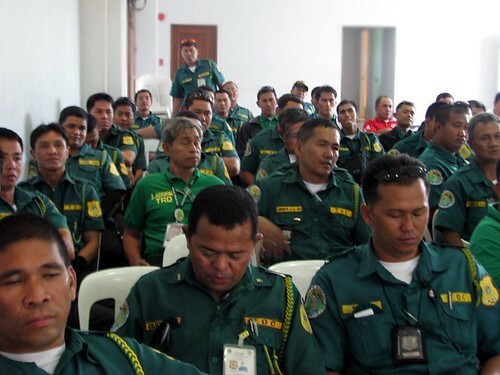 The lectures aimed to promote awareness of the various disabilities, as well as practical techniques on how to help these pedestrians and motorists, among the 200 MMDA traffic enforcers and deputized community workers in attendance. ASP President Mary Jan Pena graced the Makati lecture; while ASP Auditor Grace Adviento spoke at the one in Marikina. I had the pleasure of attending the Marikina lecture, together with 115 Duty Bearers from different barangays of Marikina -- Concepcion, Parang, Marikina Heights, Dela Pena among others -- the Bantay Bayan, City Transportation Management and Development Office (CTMDO) and the Traffic Engineering Office. A few minutes before the start of the program, the 1Pangako video was played on loop. ASP Secretary Mona Magno-Veluz also spoke briefly about the 1Pangako campaign (which aims to stop the derogatory use of the word "autistic") and led the room in a mob pledge. ASP self-advocate Carl Veluz lead the participants in the opening prayer -- a fitting start to the sensitivity training towards persons with disabilities. Mr. Rodrigo Domingo of City Social Welfare Development (CSWD) office graced the event with his welcome message that focuses on removing barriers – the physical and the social stigma - that discriminate and limit the possibilities of PWAs. In keeping with the theme of the National Autism Consciousness Week, the event is all about “Autismo: Alamin, Pagtanggap at Palaganapin” -- that is, equipping the traffic enforcers on how to serve our PWAs without discrimination. Ms. Grace Adviento was candid and humorous; but was knowledgable and professional in sharing information on autism. Understanding the typical behaviors and capabilities gives the audience a feel for what to expect if they meet them on the road. She also provides practical ways to assist pedestrians on the spectrum if the need arises. Ms. Grace Adviento from ASP, Ms. Joy Lopez from Resources for the Blind, and Ms. Yvette Apurado from De La Salle-College of Saint Benilde School of Deaf Education and Applied Studies -- the speakers for the event carried inspirational messages of understanding and compassion for PWDs. The participant went home filled with new insights that will transform them to more effective and sensitive Duty Bearers on the streets. This article was contributed by Cora Hugo-Mina, ASP Angel Corps Volunteer.